Nature doesn’t always play fairly. Anyone with an autoimmune condition is predisposed to developing other autoimmune conditions, and there is a particularly strong connection between celiac disease and autoimmune thyroid disease (ATD), which includes Hashimoto’s and Graves’ diseases. Despite this connection, routine cross-screening is rare. Since these conditions frequently lead to significant changes in weight, RDs are in a prime position to spot common symptoms and provide clients with potentially lifesaving referrals for further testing and diagnosis. This article will review the overlapping symptoms, examine the current research on the relationship between these diseases, explore how a gluten-free diet affects both conditions, and describe the ways in which RDs can most effectively support their clients and patients. 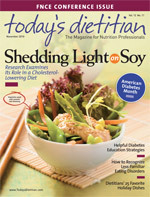 Understanding the connection between celiac disease and thyroid disease can help dietitians design strategies for appropriate dietary management and support. When an individual with celiac disease consumes gluten, an autoimmune process is triggered and the body attacks the villi of the small intestine, often leading to malnutrition. A similar autoimmune process occurs with ATD—except in this case, the target is the thyroid gland, producing a deficiency or excess of hormones and wreaking havoc on the body’s metabolism. The most common type of ATD is hypothyroidism, often caused by Hashimoto’s disease, which occurs most frequently in women during middle age and leads to a slowing of the metabolism. Graves’ disease is a hyperthyroid autoimmune process wherein the body attacks itself and the thyroid gland produces too much thyroid hormone. A 2010 study in the Journal of Pediatrics found that 11 of 15 children with celiac disease who had elevated thyroid-stimulating hormone levels at diagnosis with celiac saw these numbers normalize after 12 to 18 months on a gluten-free diet.13 The Naiyer study noted that among people with celiac disease, significantly more people have thyroid antibodies before going gluten free than after (37.5% vs. 4.4%). The study also showed a positive correlation between anti-tTG and thyroid antibody titers in patients with active celiac disease.13 The only way to reduce anti-tTG levels is to eat a gluten-free diet. These studies suggest that a gluten-free diet has the potential to improve thyroid function by reducing autoimmune reactions in the body. And in patients experiencing malabsorption due to celiac disease, a gluten-free diet will alter absorption levels and can change the amount of thyroid and other medications needed. Balancing nutritional needs and weight can be tricky on a gluten-free diet. Many people with celiac disease gain weight because many premade gluten-free foods are higher in calories, fat, and sugar. Cynthia Kupper, RD, executive director of the Gluten Intolerance Group, advocates emphasizing from the start that clients eat healthful foods. “I teach my clients that gluten-free products are calorically dense. I teach them comparisons right off the bat that many of these products will lead to weight gain. I get them onto a more naturally gluten-free diet [with] whole grains, fruits, and vegetables and supplement with specialty gluten-free products,” she says. It is important for dietitians to work with clients to set appropriate weight goals and other measures of success, such as increased fiber intake, higher fruit and vegetable consumption, increased exercise, and proper laboratory measures, to keep them engaged and making progress. There are many good resources for eating a healthful gluten-free diet, including the Gluten Intolerance Group (www.gluten.net); Gluten-Free Diet: A Comprehensive Resource Guide by Shelley Case, RD; and The Gluten-Free Nutrition Guide by Tricia Thompson, MS, RD. Since celiac disease and ATD tend to lead to weight changes and fatigue and adopting a gluten-free diet often leads to weight gain, it’s easy for patients, dietitians, and physicians to incorrectly assign blame. “A lot of thyroid patients assume that if I’m tired, fuzzy brained, and puffy, it must be my thyroid. But if they are doing what they should be and have worked with doctors to optimize their symptoms, it’s time to look further at dietary factors like gluten or food sensitivities,” says Shomon. Another red flag is when patients take increasingly large doses of thyroid medications and fail to have the expected response. Similarly, a detailed diet and exercise diary can indicate whether increases in weight are due to eating a highly refined, calorically dense gluten-free diet or whether thyroid problems or other conditions may be contributing, too. As a general rule, when working with clients with autoimmune conditions who are continuing to experience unexplained symptoms despite the proper treatment, further testing may be warranted. RDs often get a broad look at a client’s health history and are in a unique position to see the potential links and provide guidance and support. The majority of clients seeking an RD’s services are either unintentionally gaining or losing weight. Since most people with both celiac disease and thyroid conditions are undiagnosed, referrals to a knowledgeable family physician, gastrointestinal doctor, or endocrinologist when appropriate can provide vital direction and ultimately help clients reach long-term weight and health goals. Recognizing and discussing the links between conditions and referring patients for further support and evaluation may be invaluable. — Cheryl Harris, MPH, RD, specializes in celiac disease in Alexandria, Va. Gary Kaplan, DO, is founder and medical director of The Kaplan Center for Integrative Medicine in McLean, Va.
3. Guandalini S, Vallee PA. Celiac disease. Updated May 4, 2010. Available at: http://emedicine.medscape.com/article/932104-overview. Accessed June 20, 2010. 4. Alexander EK, Marqusee E, Lawrence J, et al. Timing and magnitude of increases in levothyroxine requirements during pregnancy in women with hypothyroidism. N Eng J Med. 2004;351(3):241-249. 5. Elfström P, Montgomery SM, Kämpe O, Ekbom A, Ludvigsson JF. Risk of thyroid disease in individuals with celiac disease. J Clin Endocrinol Metab. 2008;93(10):3915-3921. 6. Fasano A, Berti I, Gerarduzzi T, et al. Prevalence of celiac disease in at-risk and not-at-risk groups in the United States. Arch Intern Med. 2003;163(3):286-292. 7. Ch’ng CL, Jones MK, Kingham JGC. Celiac disease and autoimmune thyroid disease. Clin Med Res. 2007;5(3):184-192. 8. Larizza D, Calcaterra V, De Giacomo C, et al. Celiac disease in children with autoimmune thyroid disease. J Pediatr. 2001;139(5):738-740. 9. Berti I, Trevisiol C, Tommasini A, et al. Usefulness of screening program for celiac disease in autoimmune thyroiditis. Dig Dis Sci. 2000;45(2):403-406. 10. Naiyer AJ, Shah J, Hernandez L, et al. Tissue transglutaminase antibodies in individuals with celiac disease bind to thyroid follicles and extracellular matrix and may contribute to thyroid dysfunction. Thyroid. 2008;18(11):1171-1178. 11. Duntas L. Does celiac disease trigger autoimmune thyroiditis? Nat Rev Endocrinol. 2009;5(4):190-191. 12. Ventura A, Neri E, Ughi C, et al. Gluten-dependent diabetes-related and thyroid-related autoantibodies in patients with celiac disease. J Pediat. 2000;137(2):263-265. 13. Cassio A, Ricci G, Baronio F, et al. Long-term clinical significance of thyroid autoimmunity in children with celiac disease. J Pediat. 2010;156(2):292-295.